In July 2015, some U.S. Air Force personnel were hiking about eight miles up North Fork Chewelah Creek, in northeastern Washington, when they found the chewed-up remains of a cow. They notified the Washington Department of Fish and Wildlife, which sent out investigators the next day. The investigators found a second carcass nearby and three days later, discovered two more — a cow and a calf. 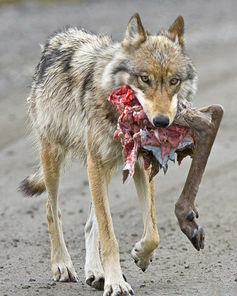 Wolves, they determined, had killed all four animals. The dead cattle were squarely in the territory of a wolf pack called Dirty Shirt, and local ranchers’ reactions were predictably fierce. “The time for the removal of the Dirty Shirt pack is now,” Justin Hedrick, the president of the Stevens County Cattlemen’s Association, said in a statement. 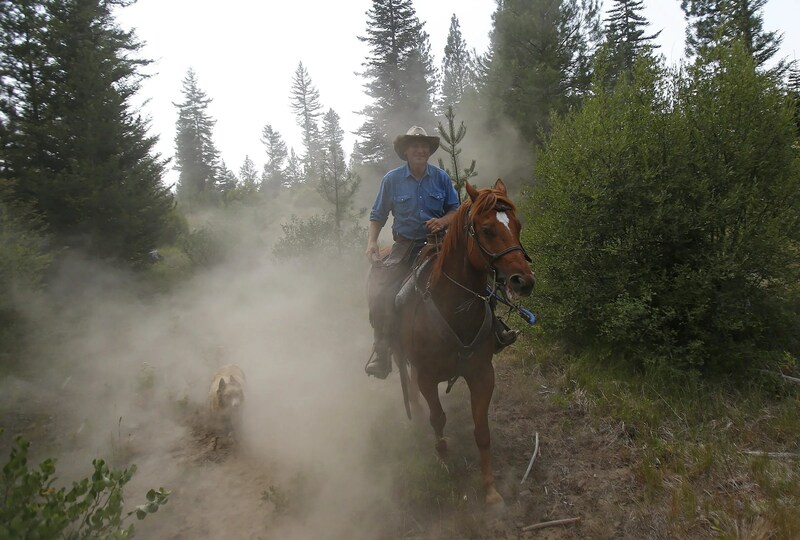 But instead of mustering sharpshooters, wildlife officials sent riders on horseback to keep the wolves away. They used generators to shine bright lights around the rest of the herd, while other employees patrolled the area. 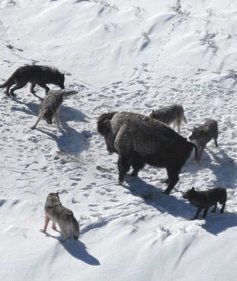 They shared data on the pack’s location — three wolves are radio-collared — with area livestock producers, so other cattle could be shifted out of harm’s way. But they also said that if the wolves killed more cows, they would consider shooting them. Within a few days, the pack moved to a different part of its territory, and fears died down. Three months later, its wolves remain on probation of a sort, but the state hasn’t taken further action. 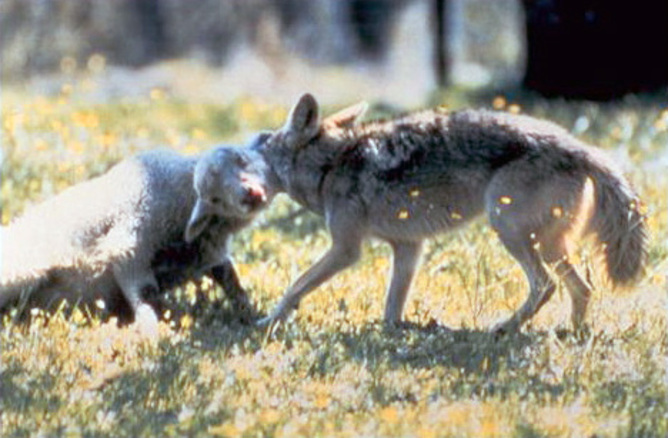 And even though tempers still simmer, the incident shows the difference between wolf recovery in the Northwest compared to the Rocky Mountains or the Southwest. Washington, with its generally more progressive politics, was able to adopt policies that would have had little traction in the Interior West. But even here, thanks to stark urban-rural political divides, the effort’s successes come by way of a very delicate and ongoing balancing act. Despite proof that changes inlivestock husbandryreduces predation, farmers may still not want these creatures living near them as they may feel that the carnivores have “won” or taken over “their” land. POACHING – A Whitman County wolf-shooting case has been turned over by state officers to County Prosecutor Denis Tracy. Washington Department of Fish and Wildlife police delivered their evidence to the prosecutor on Nov. 19. The man who shot a wolf around Oct. 12 could be charged with a misdemeanor for killing an animal that’s protected in far-Eastern Washington by state endangered species laws, said Steve Crown, Fish and Wildlife police chief. The agency turned over case after receiving DNA lab results that confirmed the animal was a wolf and not a wolf hybrid. Tracy’s office staff said Wednesday that the prosecutor is still investigating the case and has set no deadline for making the decision on whether to prosecute. The identity of the shooter has not been released although WDFW officers described the man as a county farmer. The original WDFW report said the man chased the wolf in a vehicle and shot it in a Palouse farm field about 15 miles southwest of Pullman. Although exemptions are made for killing a wolf to protect life or livestock, unlawful taking of a state endangered species is punishable by sentences of up to a year in jail and fines up to $5,000. The only wolf-killing case to be prosecuted in Washington resulted in Twisp ranching family members being ordered to pay fines totaling $50,000 in 2012 for killing two Lookout Pack wolves in 2008. Those wolves also were protected by federal laws. A Kittitas County wolf-killing case remains under investigation. U.S. Fish and Wildlife Service spokesman Brent Lawrence said Tuesday no arrests have been made in the October shooting of an adult breeding female belonging to the Teanaway Pack near Salmon la Sac. Conservation groups have offered a $15,000 reward in the case. Another wolf was found shot to death Feb. 9 near Cedar Lake in northeast Stevens County. Conservation groups joined with the Washington Department of Fish and Wildlife to offer a $22,500 reward for information about the case. The case remains unsolved. BIRDS – Four bald eagles were counted Wednesday at Lake Coeur d’Alene in the weekly fall survey conducted during the annual fall-winter congregation at the northeast corner of the lake. That’s up from zero birds counted last week by U.S. Bureau of Land Management biologist Carrie Hugo in her first survey of the season. Eagles were at Higgens Point and in the Beauty Bay area this week, she said. For decades, the eagles have provided a popular wildlife-viewing attraction as the birds are lured from mid-November into January to feast on the spawning kokanee that stack up in Wolf Lodge Bay. “It is not too unusual for the count to be very low (in mid-November),” Hugo said. The 2013 bald eagle count at Lake Coeur d’Alene peaked at 217 on Dec. 30. SEATTLE— Conservation groups are offering up to a $15,000 reward for information leading to conviction of those responsible for the illegal killing of the breeding female wolf of the Teanaway pack in Washington’s Okanogan-Wenatchee National Forest. The killing is one of several in the past year jeopardizing the recovery of Washington’s gray wolves, which are fully protected under the federal Endangered Species Act in the western two-thirds of Washington and throughout the state under state endangered species law. 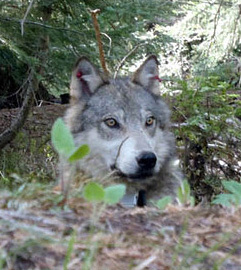 Teanaway pack wolf courtesy Washington Department of Fish and Wildlife. This photo is available for media use. State and federal officials recovered the dead Teanaway pack breeding female on Oct. 28 near the Salmon la Sac area north of Cle Elum. Based on GPS collar data, U.S. Fish and Wildlife Service agents believe the animal was killed around Oct. 17. The Fish and Wildlife Service has requested that anyone with information about the killing of this wolf, or who might have noticed suspicious behavior in the Teanaway area, to contact federal law enforcement agents at (206) 512-9329 or (509) 727-8358. State law enforcement may be contacted at the 1-877-933-9847 hotline for reporting poaching activity in Washington. Reports to this hotline may be made anonymously. “Whether one supports or opposes wolf recovery in the Northwest, poaching like this is an unacceptable abuse of our shared natural heritage,” said Jasmine Minbashian, communications director for Conservation Northwest. The groups coordinating the reward for information leading to a conviction in this case include the Center for Biological Diversity, Conservation Northwest, Defenders of Wildlife, The Humane Society of the United States, The Humane Society Wildlife Land Trust, and Woodland Park Zoo. There were only 52 confirmed wolves in Washington at the end of 2013, with five of Washington’s packs statewide having confirmed breeding pairs – two in the North Cascades and three in Northeast Washington. This killing is the second breeding pack female lost in Washington in 2014, and has left the North Cascades Recovery Region with the potential for only one successful breeding pair, a decline back to the 2008 breeding level. The other known loss in 2014 was the Huckleberry pack breeding female in northeastern Washington in August. The state wolf conservation goal is a minimum of 15 successful breeding pairs for three consecutive years in three recovery regions across the state from eastern Washington to the Olympic Peninsula. To date, numbers of successful breeding packs in the state have been stagnant at five since 2012. Washington’s wolves were driven to extinction in the early 1900s by a government-sponsored eradication program on behalf of the livestock industry. Since the early 2000s, the animals have started to make a slow comeback by dispersing into Washington from neighboring Idaho and British Columbia. Human-caused mortality has been a major cause of losses for Washington’s wolves since wolves began recolonizing the state in 2007, including wolves in at least six of the state’s known packs (Lookout, Ruby, Wedge, Huckleberry, Teanaway and Diamond packs). The killings have included the breeding females in four of the state’s productive packs (Lookout, Wedge, Huckleberry, Teanaway). Because the Teanaway pack represents the southern edge of confirmed wolf recovery in Washington’s Cascades, the pack’s continued survival is critically important to meet the state’s recovery goals. The state Department of Fish and Wildlife, local ranchers and conservation organizations have invested extensive time and resources to prevent conflict between this wolf pack and livestock, including co-sponsoring range riders to supervise sheep and cattle herds. These efforts have been successful, with no reported conflicts within the territory of the Teanaway pack in recent years. State wildlife officials recently described the Teanaway wolves as a model pack. 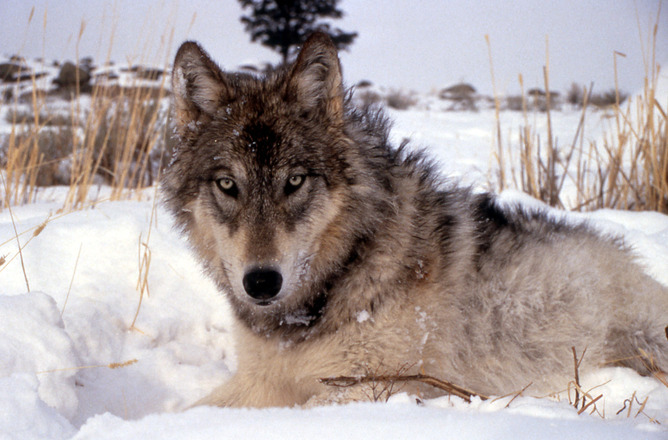 With the loss of its breeding female, the pack’s future success is now in jeopardy. Groups sponsoring the reward are working together to advance wolf recovery in Washington through the state’s 2011 Wolf Conservation and Management Plan.